India is cursed with bad governance and bad governments. Since the 1970's while neighboring countries in the ASEAN region - India invited 10 of them for the Republic Day celebration - were busy growing their economies and enrichening a large chunk of their people, most regional and national politicians in India were busy trying to keep people poor and ignorant and focused their election campaigns on issues centered around religion, caste, and class. It is a remarkable commentary that, in a country where religion plays such a key role in every political decision, the communist state of Kerala leads on many social indicators! The BJP won a large mandate in the May 2014 elections and routed the utterly incompetent and corrupt Congress-led coalition, the UPA-2 government (Modi-bhakts please enjoy this moment). What is significant to note, though, is that the BJP did not win as historical a victory as it was claimed to be. The Modi-led BJP won "only" 31% of the national votes, as against 34% by the Vajpayee-led BJP in 1999. The reason why the Modi-BJP won an outsized number of 282 seats as against 182 seats that Vajpayee-BJP won despite getting a larger vote share than the Modi-BJP is that the regional parties won more percentage votes in 2014 (50%) than they did in 1999 (45%). These "wasted" votes of the extra 5% to regional parties gave the Modi-BJP a larger number of seats. So, the Modi margin of victory was a default win! To stay in power comfortably and for a long period of time to undo the actual and alleged sins of the conning Congress governments, the BJP knows that it needs to win 40% of the votes - not the 31% that it has received in the 2014 elections. Keeping politics aside, the budget is based on a crucial platform of hope as opposed to a foundation of development effort. 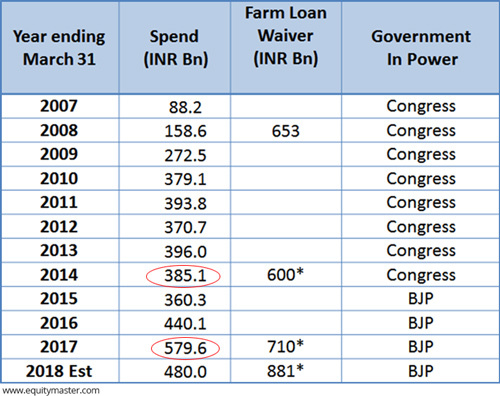 Constrained by decades of Congress-originated policies, the BJP has little choice at this stage to make any fundamental shift in allocations of where the money the government can spend will go. With over 61% of its annual spend committed to interest payments on debt, salaries, pensions, subsidies and defence there is little that the government can do. 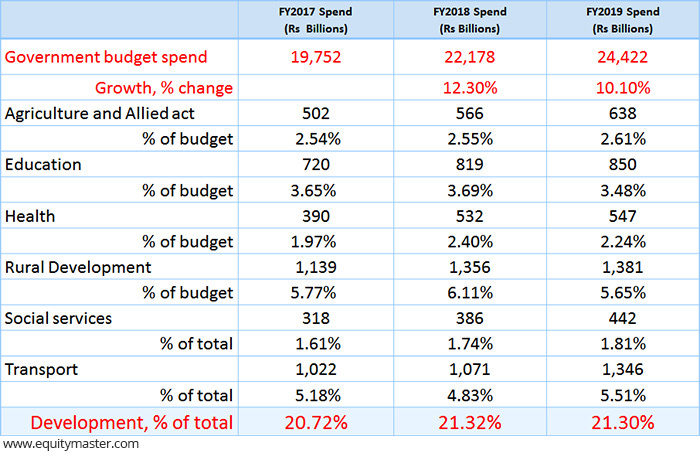 However, what is noteworthy is that - despite the increasing threats of confrontation with Pakistan and China, defence spending has been reduced and subsidies have increased. It shows the focus of the next 12 months. Interest payments have reduced only because the interest rates have reduced. With interest rates on the rise, this may be a developing fault line. 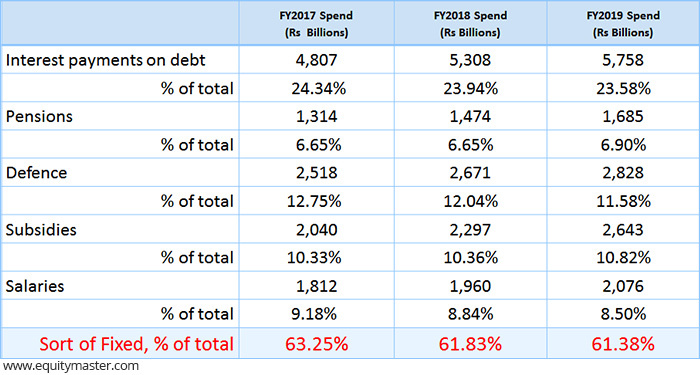 The "development" side of the expenditure has been limited largely because the government has not fully accounted for the necessary and ambitious universal health care coverage: Rs 500,000 per family for 100,000,000 families. . It is a good move. But the Rs 2,000 crore allocated for it (Rs 200 per family) is, by many estimates, 10% of what it should be. A Budget speech with little money behind it? However, just as India steps into election mode where this government - like previous governments - focuses on winning elections, the global mood has changed. With interest rates increasing in USA, there will be a reassessment of risks taken and rewards needed to offset the risks taken. Under a zero-interest rate policy in the developed world, India (and other emerging markets) could attract large flows at low expected rates of return. As interest rates rise in USA, investors may demand a higher rate of return from Indian bonds. This will result in a tectonic shift in bond and stock market valuations. Current A/c deficit under threat? 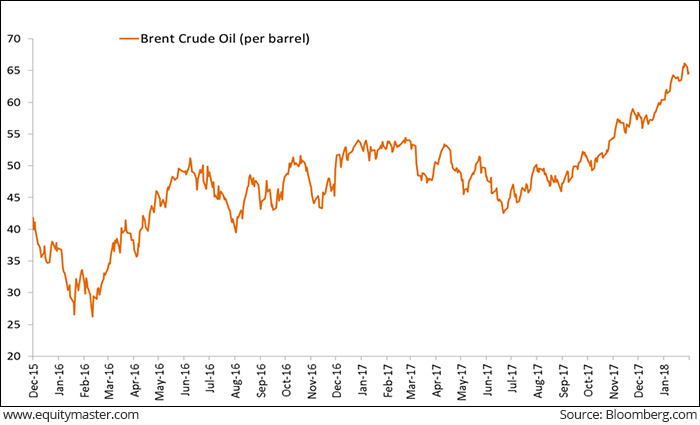 Higher oil prices have reduced the cushion that India has on the import costs and on the subsidy front. Paying less for imported oil reduced the drain on foreign exchange and kept the Indian Rupee strong against a weak US Dollar. Additionally, lower oil prices meant that the cost of subsidizing the usage of energy for poorer Indians was kept under control. Lower energy costs also reduced inflation and allowed interest rates to increase. Those multiple benefits are now unravelling. 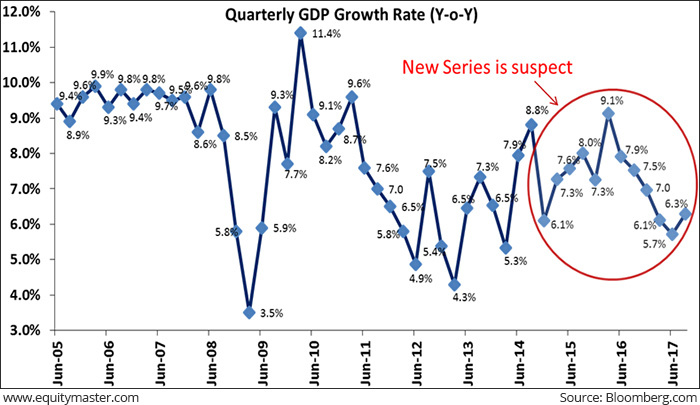 Just as the macro is turning grim, the natural recovery within the Indian economy will pick up steam. Having been whacked on the chin by demonetization and bruised by GST, a battered economy is picking itself up from knock-out as suppressed consumer demand seeps through. 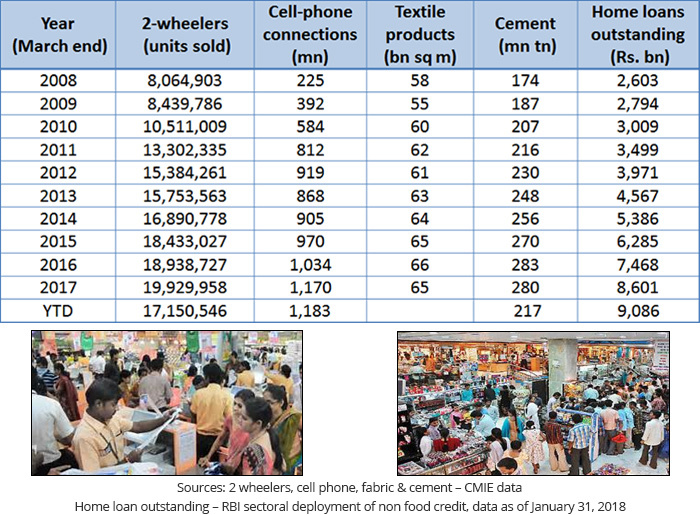 Indians Still Consuming: The Hungry Consumers! Under threat due to rising oil prices and the Bernanke fear of raising interest rates. As 2019 nears, the BJP has steered itself into a position where it has no widespread corruption scandals (a great positive, indeed!) to show but it has little else to show. Demonetisation was a dud idea that cost the country dearly and resulted in the government using its scarce resources to bail out the poor. The BJP bungled the opportunity of a supportive global macro environment to take India to a higher trajectory of growth. History not only rhymes but it also repeats itself in painful, karmic cycles. Despite faster download speeds and more people racing along the internet highway, India is back where it was in 2013: a rudderless boat waiting to be lashed by the storms that may unfold on foreign shores. The budget is a gamble that there will be no storm. Equitymaster requests your view! Post a comment on "The Big Gamble". Click here! 2 Responses to "The Big Gamble"
I doubt that the communists have a role in the improvement of social indicators.The ground work dates back to enlightened Rajas who pushed for education and health in a big way.The popular govt has been alternating between congrees and otheres and the The communists for quite a while.Kerala also leads in Consumption ,Alcoholism,Suicides etc ..That is another story.In short Gods own country has lot of problems including communalism which is mentioned. To start a quirky comment.. you write the Communist state of Kerala is leading in social indicators. Are you referring to the Communist mindset of the state or that it has had governments run by the Communists and Left Front parties? But if you visit Kerala now, you will see dramatic change in the social fabric. Barring some vestiges of the so - called communist mindset, the state of Kerala is now under the grips of overt and covert communalism and religion based politics, overt and sometimes gaudy consumption and the make-believe world of the long running soap operas called serials. When I see it ,I am amazed at this change, and don't know should I react as an observer or a participant. While the communal tension was there, it was slight and definitely in the background, but now it is in the face and pathetic too. I do miss the sanguine environment in my native town where I would celebrate my summer vacations wrapped in the love of my aunties , uncles and couzins. Net-net , the social indicators that you refer to are likely to change pretty soon and my guess for the worse !